For the past 19 years, the WCCD has organized the collection and disposal of Christmas Trees in Worland and Ten Sleep. Every year, an army of volunteers from the Natural Resources Conservation Service, Washakie County Conservation District, Worland Rotary Club, Chief Washakie FFA, and the Ten Sleep Sage Stompers 4-H Club team up to pick up Christmas Trees in alleys of Worland and Ten Sleep. The District organizes groups to pick up Christmas Trees on a scheduled day each year. They ask local residents to leave their trees (which need to be clean and free of all decorations, tinsel and stands) beside dumpsters in alleys the morning of the pickup. Over the majority of these past several years, Big Horn Rural Electric Company has donated their equipment and manpower to chip the Christmas Trees. The mulch is made available, at no cost, to local residents. In 1998, the Washakie County Conservation District (WCCD) purchased three receptacle bins to place in Ten Sleep to receive Aluminum cans, office paper, newspaper and magazines. As well, the District built a wooden enclosure for cardboard. In 2008, the WCCD purchased a compartment-type recycling trailer for the community of Ten Sleep's recycling program. In the past, the recycling trailer was taken to the Worland landfill by the local 4H club. Currently, the recycling trailer is used to collect corrugated cardboard, office paper, newspaper and magazines. The city of Ten Sleep administers local volunteers to haul the recycling trailer to Worland where recyclables are collected at the Worland landfill. To continue our support for community recycling, the WCCD helps cover the costs of transport. As a member of the Reduce Reuse Recycle (R3) Coalition, WCCD has now successfully hosted 8 household hazardous waste collection events where Washakie County residents have the opportunity to recycle old refrigerators, paint, oil, batteries, chemicals, and computers, at no charge. The R3 is made up of members representing Washakie County Cooperative Extension Service, Washakie County Weed and Pest District, Washakie County Homeland Security, Washakie County Public Health, Worland Bureau of Land Management, Worland Landfill, Worland Fire Department, and Worland Recycles. Prior to each event, the Washakie County Weed and Pest has applied for grant funds from the Wyoming Department of Agriculture to help pay for the disposal of pesticides and herbicides. 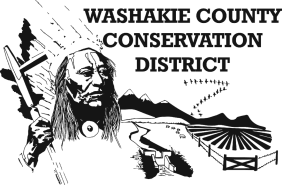 In addition, the Washakie County Conservation District provides $5,000.00 to support the collection day event. The collection events have been well received by local residents and surveys taken of those who participated showed that there is a need to continue this service. The next household hazardous waste collection day will be May 14, 2016.